You may be 32 36, but that's not to say that the kid in you is long gone. At this week's Toy Fair in New York City, VTech took a welcome step away from the landline handset department and tried its hand with a few swank toys. 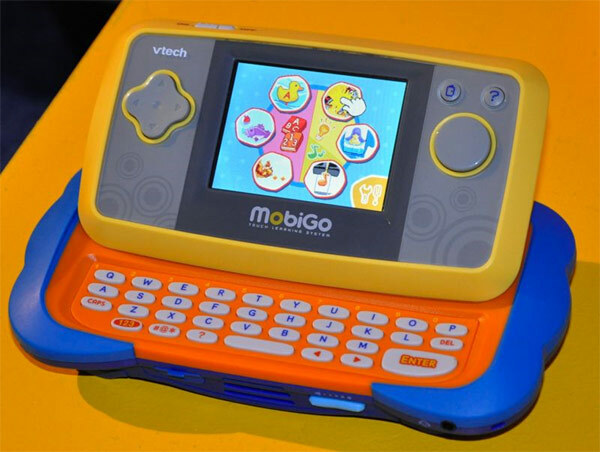 Up first is the $59.99 MobiGo (shown after the break), a handheld gaming system designed for minds within humans aged 3 to 7. Seen as a little tike's GameBoy, the device supports touch inputs and even features a QWERTY keyboard, both of which can be used to fish, color, draw, play on-screen instruments and generally enrich those malleable brain cells. Potentially more interesting, however, is the Flip; described as the planet's first children's animated e-reader, this $59.99 device has a 4.3-inch color touchscreen, a built-in dictionary and a QWERTY keyboard. Look out, Kindle!